Villa Cabo Mango is the perfect home for boaters and/or water lovers seeking an upscale residence with direct access to the Gulf of Mexico. 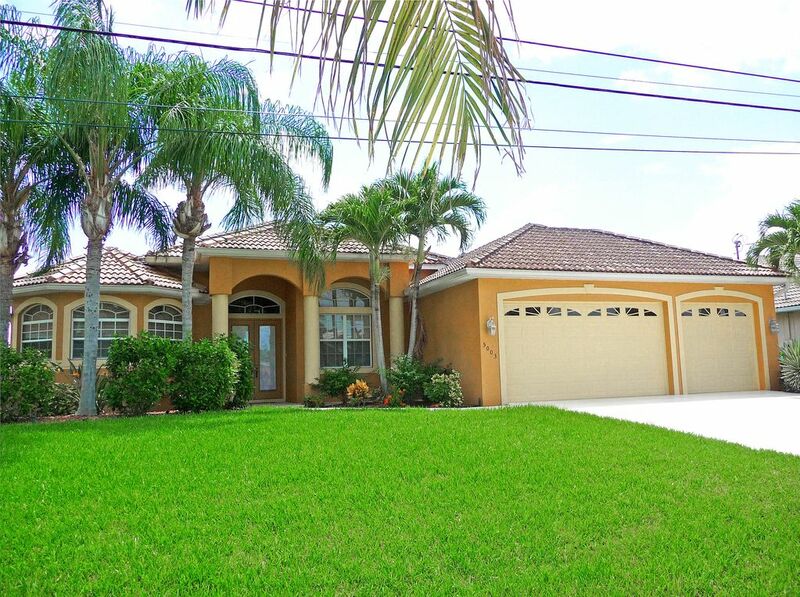 Located on a quiet culdesac street just minutes by boat or car from the popular Cape Harbor or Tarpon Point areas of Cape Coral, it offers direct boating access to the gulf with no bridges or locks to impede access. Cruise to the Gulf of Mexico and/or out to the romantic beaches on Sanibel and Captiva Islands; or to any of the other hundred plus tropical Islands in South West Florida. Or perhaps enjoy a cruise to Cabbage Key where the only access is by boat. It's claimed here at the Cabbage Key Inn is where Jimmy Buffett was inspired to pen his song 'Cheeseburger in Paradise'. Then at the end of the day, dock your boat at your private dock on the canal behind your house, refresh with a dip in your heated pool, then relax with your favorite drink while Bar-BQing on the lanai poolside. All the while enjoying the tropical air and dockside water view. Villa Cabo Mango was built in 2001 and encompasses 2263 sq ft of fully air conditioned single story living space plus an electrically heated pool. It has been decorated with soft warm contemporary colors and furnished to offer the utmost in luxury and relaxation providing the ideal tropical getaway for friends and guests with all the amenities of a private resort. The home has the popular Great Room layout where living, dining and kitchen are combined to make a single spacious living area where everyone can share in the activities, whether they be cooking, watching TV or just admiring the canal-side view. The kitchen is fully equipped with Stainless steel appliances including French door refrigerator, Florida style white cabinets, coriane worktops plus everything needed for the gourmet chef. The nook and breakfast bar share the great room and the view of the pool and canal. The great room is furnished with soft leather sofas and recliner chair (3 total recliners) with marble top tables, 55 inch flat screen HDTV, Blu-ray player, surround sound speaker bar (Bluetooth compatible) and whole home DVR. CATV includes most premium channels (HBO, Showtime, Starz, ...). The entire pool side wall is glass and slides open to the screened lanai creating a single expansive indoor/outdoor living area. The home offers 3 bedrooms (king, queen, twin), 3 full baths and a separate den. The master and queen bedrooms feature direct sliding glass door access to the lanai and pool, and both have their own flat screen HDTVs. Each bedroom has its own separate bathroom with shower, tub (2), ceiling fan, and hair dryer. The master bedroom has a large walkin closet. The in- suite master bath has twin vanities, large soaking tub, encased glass walk-in shower with rain shower head and separate hand shower. The queen bedroom bath offers a separate door access to the pool and lanai for added convenience. Twin bedroom bath offers a full bath and tub/shower combo. The den is furnished with desk, sofa and free wireless internet router. The den is perfect for those quiet evenings curled up with a favorite book; or perhaps, for planning the next day's boating adventure. The lanai is furnished with a slate dining table and seating for 6 plus an additional casual sitting area. The pool deck has 4 reclining lounges with large sun umbrella and coffee table. There is stainless steel gas BBQ with free gas bottle refills. Waterfront amenities include a full property width 'captains walk' dock and 30' boat slip. Rental boats are available (separate agreement with boat rental company) and can be delivered to your dock for your convenience. There is also an extra wide driveway and 3 car garage. Other amenities include 4 beach chairs, beach umbrella, 2 bicycles, lots of beach towels and portable ice chests for beach and/or boat excursions. And don't forget to try a fresh mango when in season (summer), from your own backyard mango tree. We are long time boaters from Southern California who love cruising tropical warm water locations like the Bahamas and Caribbean. We find Cape Coral comparable to the Bahamas, but with all the convenience and safety of a Florida location. Cape Coral to us is paradise. An idyllic town in Southwest Florida located on the shores of the picturesque Caloosahatchee River just a short boat ride to the blue-green waters of the Gulf of Mexico. We chose Cape Coral because of its small waterfront town atmosphere, its low crime rate, and more than 400 miles of navigable canals and waterways. Yet it is still just minutes from big city amenities such as restaurants, shopping, beaches and international airport. Caloosahatchee Waterway (and Gulf of Mexico access) is 20 minutes by boat from your backyard dock. There are no bridges or locks to delay your departure or return. Located on gulf access canal with dock and boat lift. Direct access salt water canal. 'Captain's Walk' dock is full width of property (80'). Canal view with private backyard access to dock and boat slip. Gulf of Mexico access with no bridges or locks to delay your cruise to open water. 2262 sq ft under air. Cost of electricity usage is included. Master and Queen bedroom linens are 800 thread count. Separate laundry room with washer, dryer and tub sink. Located in laundry room with sink. Extra wide driveway with 3 car garage. 3-car garage (1 stall may be unavailable due to small car storage - check with owner). Including lots of beach towels. Wireless router located in den/office. Great room style with wall of windows facing lanai and water. Soft leather couches and chair with 3 recliners. Built in wall unit with 55' HDTV. Stainless French door style (2 doors + 1 freezer drawer) with through-the-door water and ice. Glass top 5 ring stove with oven. Breakfast bar (seats 4), dining nook (seats 4), lanai (seats 8) . (3) Great room has 55' HDTV with whole home DVR, surround sound speaker bar with bluetooth, and Blu-ray video player. Master and Queen Bedrooms also have HDTVs. (3) Great Room, Master Bedroom and Queen Guest Room. CATV premium channels: HBO, Showtime, Starz, Cinemax, others. Whole home DVR. HDTV speaker bar has Bluetooth access. Two 21 speed Trek 'Mountain Bikes' available to guests. Boat rental available delivered to your dock. Separate agreement with boat rental company. Large screened pool deck is full property width for sunning and relaxing. There is a covered lanai for dining and 'shade time'. Pool has child safety fence, stored in garage. Coral Oaks and Royal Tee Golf courses within 5 to 8 miles. Electrically heated pool with pool toys and beach towels. Cost of electric heating included in rental. The home has 2261 sq' under air and includes a full property width dock on the salt water canal with a private boat slip and 10k lb lift. Direct boat access to Gulf with no bridges or locks. Just 25 minutes by boat to Caloosahatchee River/Gulf Access or to Rumrunners at Cape Harbor. We always enjoy our stay, Villa Cabo Mango is a wonderful home. The owner is very easy to work with and the Management company does a great job making our stay comfortable. Awesome! Place is beautiful, we had a great time, can’t wait to go back. Well maintained home in a nice neighborhood, pool was sparkling clean and all linens and beds were top notch! Would recommend! The house is grand. And pool area is the best. Excellent, quite place to unwind. Our family spent the week at this lovely home at the end of July. It was a last minute decision to spend our last week of summer vacation together away from the hustle bustle of home. Best decision ever! The owner was so helpful and accommodating. The management company so helpful. We lacked for nothing in this home. Although the Florida sunshine tried to hide, we found many sunny moments. From dips in the pool to sunsets on the dock, we enjoyed every moment. So many beaches to discover nearby. Our favorite was Sanibel Island where we got to swim with a dolphin! Oh, the mango tree in the back was the icing on the cake. We will be back and if this house is available, we will call it home once more. I promise you will not be disappointed. We have stayed in many vacation homes and this is one of the cleanest and neatest layouts we have had. Enjoy Spring Training baseball. Fort Myers is the spring training home of the Boston Red Sox and Minnesota Twins. The Fort Myers baseball parks are approximately 10 miles from Villa Cabo Mango. ELECRICITY AND WATER USAGE ARE INCLUDED WITH STANDARD RATES - NO ADDITIONAL CHARGES. 11.5% Florida Hospitality Tax is in addition to all rents. $150 Cleaning Fee, $500 refundable Security Deposit. Deposit of 25% due at booking to confirm reservation. Rates are subject to change until reservation is confirmed.